Miguel Cabrera, the Detroit Tigers’ third baseman, enters tonight’s game against Kansas City, the last game of the baseball season, leading the American League in home runs, batting average, and RBI. The last time a player in either league finished the regular season with the lead in all three categories (i.e., won the triple crown) was 1967, forty-five years ago. This is a huge deal. It’s a huge deal, and it’s failing to register a commensurate blip on the national media radar, and that’s a shame. This is not a Detroit-complex issue, a simple want of attention and validation (I’ve addressed that concept before), but if Cabrera was a member of the Yankees or Red Sox, to name two teams, Kansas City would be a media circus right now. The game would be on national radio and television broadcasts, and Sportscenter would have a running clock counting down the minutes until the first pitch. There has been some national coverage this week, it’s true, and the national baseball writers, like Jonah Keri and Joe Posnanski, have been somewhat better about this than their broadcast counterparts, but come on. This is a readily understandable, offense-involving achievement that hasn’t happened in nearly a half-century, and it’s only happened about a dozen times ever. This should be receiving the Tebow treatment, the Brett Favre’s locker treatment, heck, even the Roger Clemens pitching a minor league baseball game treatment. The NFL draft gets more coverage than this story. 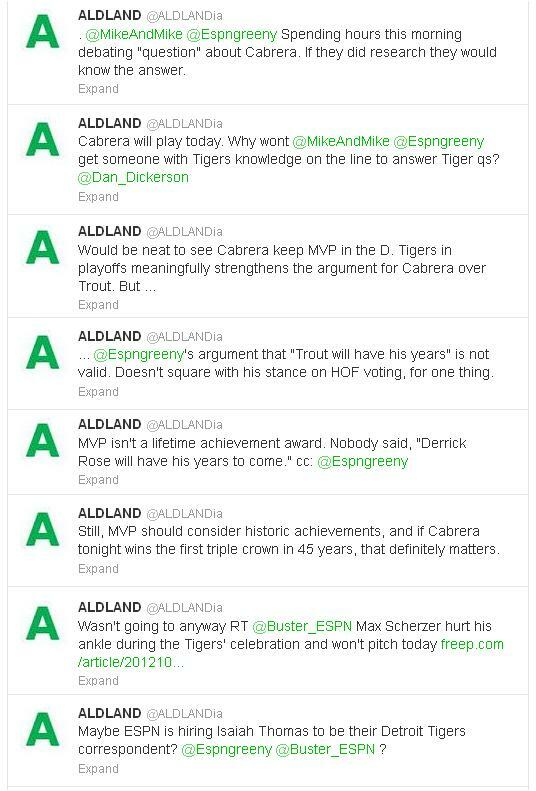 And what coverage Cabrera’s story gets, as anyone who read the @ALDLANDia feed early this morning knows, is uninformed, manufactured, trite media banter. Cabrera has been nothing but humble, deflecting, and team-oriented this entire season. He deserves the spotlight, but he’ll never ask for it. Even if he did, it’s too late now, the first pitch of the 162nd game moments away (it’ll be his 161st game of the season). He should be invited to the White House if he secures the triple crown tonight, but even those two are too busy. UPDATE: As anticipated, Cabrera held serve and won the Triple Crown last night, finishing the season with 44 home runs (a career best), 139 RBI, and a .330 batting average. This entry was posted in ALDLAND and tagged detroit, detroit free press, espn, joe posnanski, miguel cabrera, mlb, sports on earth, tebow, tigers by AD. Bookmark the permalink. At the moment of this comment, the number two “Top Story” on espn is titled: “Fit To Be Crowned”. I know there was playoff position jostling to be decided tonight, but this is the #1 story in sports by a mile.